The first edition of the Night of Philosophy in Prague – June 2016, 16/17th – has offered a round-the-clock series of 20-minute lectures and larger roundtable discussions presented by 55 leading international philosophers from France and the Visegrad Group, on the topic “Images, Sciences and Politics.” The night has been held in three different languages – Czech, English, and French – with simultaneous translations. 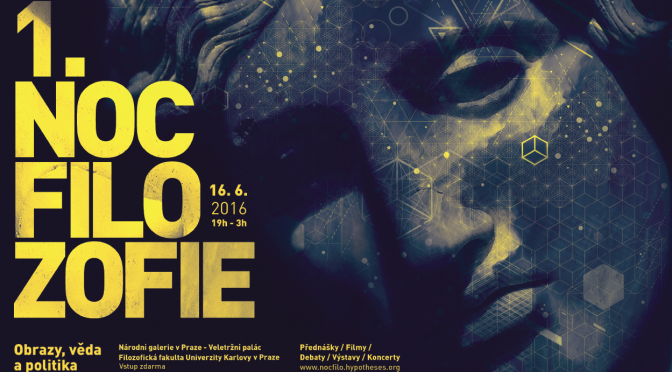 It has taken place in two locations, the large Trade Fair Palace of the Prague National Gallery and the Faculty of Arts of Charles University in Prague, where lectures, debates, exhibitions, performances, literature readings, and movies commented by artists and philosophers have run throughout the night, from 7 PM until 3 AM. This innovative and nocturnal happening gathered together philosophers and artists, and its ambition was to give the general public an original and interactive access to philosophy and to present the most contemporary social and political debates and their involvement in artistic creations. A program prepared by Anne Gléonec and Obřej Švec – see here! The first Night of Philosophy was created in Paris in 2010, and since, has met with international success, as it successively took place in major cities of the world: London, New York, Buenos Aires, Tel-Aviv, Berlin, Athens, and now Prague, in the heart of Europe! Discover the blog of the Night of Philosophy! Discover the video from the Night of Philosophy!